Installing pavers can be an easy weekend project when you have an understanding of the basic steps required. If you've considered placing pavers on your property, read on to learn the correct way of measuring and installing pavers. Start with planning the layout of the paver project. Begin by putting your plans on graph paper. Second, create the design from the graph paper onto the ground. 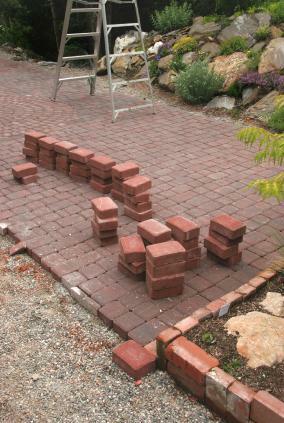 This can be done using a garden hose, string or spray paint to make a rough layout of where you want to lay the pavers. The next step is to calculate the area of the project to determine the number of pavers needed. To determine how many pavers are needed, measure the length and width of the project area. This calculation will produce a rough estimate. If the project requires that a few of the pavers will need to be cut, add five percent to the total number of pavers. If many of the pavers will need to be cut, add ten percent to the total number of pavers required. Excavation of the site may be the most time consuming part of the project. To begin the excavation, determine how thick the pavers are. Then add the depth of the base and sand. Add these together and it will give you the depth that will need to be dug before the pavers can be laid. Once the area has been dug out, the soil will need to be compacted with a compacting machine. Before installing pavers, the base materials need to be added to the dug out area. If the pavers will be laid where weeds are a problem, it is advisable to lay plastic sheeting that weeds cannot penetrate on the ground first. Next, crushed stones will need to be spread in the area. The crushed stones can be laid in two steps, compacting them after each application to ensure that they are even. After the stone has been laid, it is time to add a layer of sand. The layer of sand should be from one to one and a half inches thick. The sand also needs to be dry, not wet. The layer of sand can be smoothed with the edge of length of board, such as a 2x4. The next step is installing pavers. Lay the pavers in the desired design, cutting pavers as needed. Be sure to leave a space between each paver to create the sand joint. Once the pavers have been laid, run a compacter over the pavers to press them evenly into the base materials. The next step is the creation of the sand joints. Dry, fine-grained sand is needed for this step. Spread the sand over the pavers with a push broom, sweeping the sand into the space between all of the pavers, filling them to the edge of the pavers. If you don't want your pavers moving around, edge restraints will keep your pavers looking tidy. Edge restraints are especially helpful in areas where cold winters cause heaving of the ground. They will help to keep pavers where they were originally laid. Edge restraints are made from various materials including plastic, aluminum and concrete. Sealant can help to protect your pavers, especially those that are in high traffic areas. While this step isn't required, it will keep your pavers looking new and make them easier to clean. This works best for pavers that utilize sand joints, not those that have plant materials, such as thyme, growing between them. To seal the pavers, clean and sweep the area where sealant will be applied. Apply the sealant evenly, including on the sand joints of the pavers. This will help to keep the sand where it belongs and inhibit weed growth. Pavers can be made of many different materials to match a home's style and surroundings, such as flagstone, concrete or red bricks. When installed correctly, pavers are low maintenance and will add beauty and enjoyment for years to come.